This division of Park Maintenance and Properties is responsible for development and implementation of the Citywide property maintenance management and oversees the Parks, Cemeteries, Golf Courses, Urban Forestry, maintenance of Vacant Lots, Greenhouse and Task Force Program assignments. The objective of this program is to keep vacant lots and the exteriors of vacant structures within the City aesthetically pleasing and to eliminate health and safety hazards. Activities include cutting high grass, weeds and remove debris from vacant properties. As weather permits, Vacant Properties Operations also runs a yearlong dumping initiative. This program removes large debris from vacant properties using a commercial loader and trucks. The debris is properly disposed of and the owner of the vacant property is billed for services. This program works systematically through the city, with wards having the most dump locations receiving first priority. Owners who abandon their property will be charged for maintenance services and a fine will be incurred. Problem properties can be reported by calling the number above. Owners whose property has been serviced by the city are billed for services. If the bill is not paid within 30 days, it is sent to the County and placed as a "special assessment" on the owner's property taxes. Those wishing to protest the invoice or services are asked to call 216.420.8367. Property owners are advised to have information, including service dates, available to expedite this process. The Greenhouse was initially used solely for growing the plants used to landscape City parks and gardens. While city beautification is still one of its goals, the Greenhouse and grounds have since evolved into a Botanical garden with specialty plant collections, seasonal floral displays, and theme gardens. The goal of Urban Forestry is to provide a safe urban forest while striving to preserve its natural beauty. This office's activities include the pruning of street trees, the removal of trees that are a risk to public safety and the planting of street trees (when funding is available). The City of Cleveland Urban Forestry Section is removing all ash trees in the right-of-way. The ash trees are infested with a non-native beetle: the Emerald Ash Borer. The borer came from China and was found in Michigan in June 2002. Since then it has spread to Canada and more than thirty US states. The beetle only infests ash trees (Fraxinus genus). There are pesticide treatments designed to kill the borer before or during an infestation. These treatments can be expensive and are only effective when administered repeatedly throughout the life of the tree. This is not a cost-effective option for the ash trees in the city’s right-of-way. It is a known fact that all untreated ash trees will die. For those with ash trees, the city recommends contacting an ISA Certified Arborist to evaluate them and to discuss options. 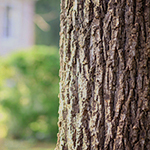 Once ash trees are removed, homeowners can call the Urban Forestry Section at 216.664.3104 for a replacement tree. The intake department will record all requests in a database. Trees are planted when a funding source is identified. Homeowners with time-sensitive needs for sidewalk repair, who are not part of the 50/50 Sidewalk Program or the Tree Damaged Sidewalk Program, can request assistance from Urban Forestry. First, a sidewalk replacement permit must be obtained from the Bureau of Sidewalks at 216.664.7434. Once a permit is in hand, the homeowner may call Urban Forestry to schedule a tree and root assessment. In order for the Forester to assess the roots, damaged sidewalk panels must be removed. A Forester will complete the assessment within 48 hours of sidewalk panel removal. If the tree cannot be retained during construction, Urban Forestry will remove it. If roots need to be removed, that will be scheduled after the Ohio Utility Protection Service has marked the site to avoid contact with underground utilities. The responsibility for the removal of the damaged sidewalk as well as costs associated with the installation of new cement is the responsibility of the property owner. This division will remove wasp, hornet or bee nests from city-owned trees if found to pose a threat to public safety. The objective of the Park Maintenance and Properties Section is to provide pleasant and attractive public areas. These areas include parks that provide playgrounds, open air shelters, ball fields and green space. Park staff is also responsible for keeping portions of downtown trash and debris free- from the Flats to East 18th Street. Summer activities include grass cutting, ball field prep, tree pruning, debris removal and setting up for special events. Park staff remains busy in the winter as well, by plowing recreation centers and city-owned parking lots.